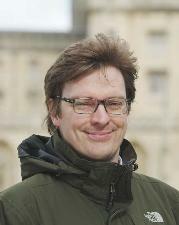 Dr Erwin Resiner is a University Reader in Energy and Sustainability and a Research Group Leader at the Department of Chemistry and a Fellow of St John’s College. Erwin also heads the Christian Doppler Laboratory for Sustainable SynGas Chemistry, is the co-Director of the EPSRC Center for Doctoral Training in Functional and Sustainable Nano in Cambridge and directs the EPSRC UK Solar Fuels Network. Finally, he is also member of the Energy @ Cambridge Strategic Research Initiative. Erwin is interested in artificial photosynthesis and solar fuels, developing novel photocatalytic systems by combining homogenous synthetic catalysts and enzymes with light absorbing nanostructured semiconductors. His research covers a wide range of disciplines, from Synthetic Molecular and Materials Chemistry to Biological Chemistry combined with Electro-, Photochemistry and Nanoscience. Erwin‘s research will hopefully contribute to the transition from a fossil-fuel dependent to a renewables-driven economy by implementing the solar-powered generation of sustainable and affordable fuels and chemicals. This transition to a sustainable society that motivates Erwin to contributing to the Sustainable Development Goals through the participation in Cambridge Global Challenges.